Burning books, toys and clothes? Diphtheria can be fatal, and before 1940 it was one of the leading causes of death in children. It’s an infectious bacterial disease that affects the upper respiratory tract and instances of it were common in the early-20th Century before vaccination against it became widespread. Due to the infectious nature of the diphtheria, it could spread quickly through children’s homes if any of the residents caught it, and a number of our records mention outbreaks of the disease. The letter below sent to head office from St Nicholas’ and St Martin’s Orthopaedic Hospital and Special School in Pyrford, Surrey, dated 1927, shows some of the measures taken to try to combat outbreaks of diphtheria. that to replace these would cost from £30-£35. to our expenditure for S. Martins. My Cttee. [Committee] recommend this for your approval. 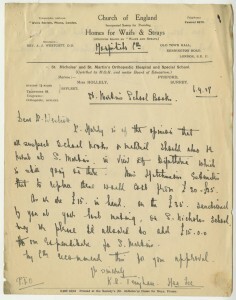 Other letters in the file show that it was thought, in this instance, that the disease had entered the home through books and toys that had been donated by the public for the children to use. As they were thought to be the cause of the outbreak, the books and toys were burned in an attempt to stop the disease from spreading further. 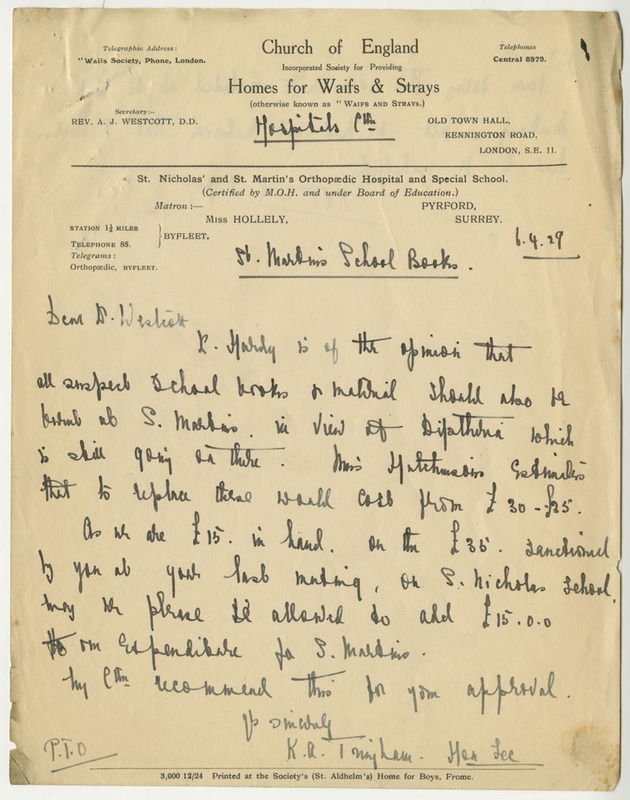 The rest of the letter asks The Children’s Society (then known as the Waifs and Strays Society) for further funding for new replacement books and toys to be bought; which later letters show was granted. As a result of the incident, it was decided that used toys and clothes should no longer be donated to St Nicholas’ and St Martin’s due to the risk of infection. At first glance, this may seem like a strong reaction, but things become more clear when you realise that St Nicholas’ and St Martin’s specialised in looking after children with conditions such as tuberculosis, polio and rickets. These children would have been very susceptible to diphtheria and other infectious diseases and the managing committee didn’t want to put their health at further risk. This entry was posted in Unexplored Riches in Medical History and tagged Children's homes, diphtheria by Janine Stanford. Bookmark the permalink. Thanks for the link, Ian. That film clip sounds really interesting; I’ll make sure to give it a watch. Widespread Diphtheria then Obesity widespread now! Todays ‘waifs and strays’ are all FAT! That’s a good point, Bobby. I think it would be an interesting exercise to compare the height and weight data of children today and see how it compares to the data from children 100 years ago. Would we find just as many children underweight and malnourished today or would the figures show a growing rise in obesity? – and it all started with a reference in Helena Muffly’s (Swartz) algebra exams and an algebra text book from 1912! Fascinating comparisons, Ian! I wonder how the heights and weights of the children who came into The Children’s Society’s care would compare to the averages of their day.